I took this photo of grasses growing in a narrow garden bed to show one of the many uses for these tufted plants. I suspect that this one is Swamp Foxtail Grass as many houses had it growing somewhere in the garden. Although I would like to have some colour in the bed, the grass worked well because of the narrow space available. It can be tidied up after flowering, particularly important with native grasses that set seeds which can be a pest. The number of times I have had to ‘deprickle’ socks and fleecy jumpers or pants. When the seed begins to loosen in the panicle is a good time to get rid of the seed head to avoid having them become a nuisance in that way. Chloris truncata (Windmill Grass) is a tufted perennial plant. Sometimes it behaves as an annual but I have proved it to be perennial if mown. 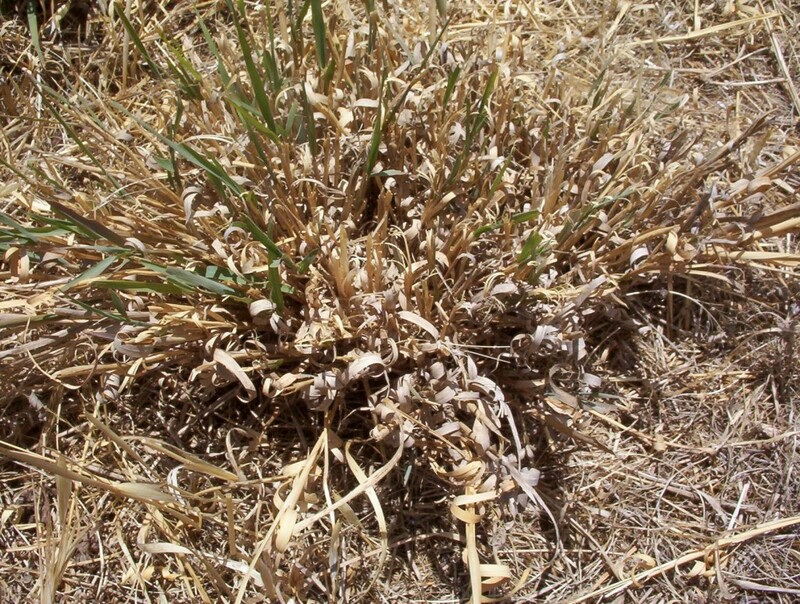 Sometimes it spreads sideways by stolons in much the same way as couch grass but not so vigorous. It is wide spread in South Australia and also occurs in the Northern Territory, Queensland, New South Wales and Victoria. It naturally occurs on sandy and clay soils including disturbed sites such as roadsides, and in grassy woodlands. Information from the Nativel Grasses Resource Group says that the seed requires a lot of moisture to germinate. It has been seen sprouting while floating on the water in a sheep trough. An easy way to replicate this is to sow the seed in a pot and stand the pot in a container of water deep enough so that the surface of the pot remains very moist. Reduce the water level as the seed germinates. We had about 3mm rain today. I don’t know how that will affect my experiment mentioned in the last post. 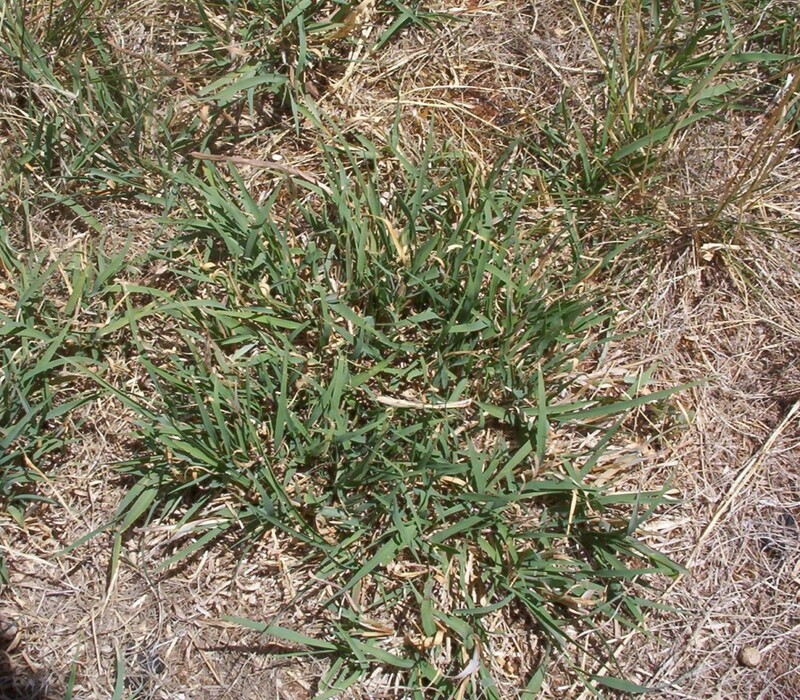 This grass is one that is on a list of reccommended lawn substitutes, along with Austrodanthonia (Wallaby Grass), and Microlaena stipoides (Weeping Rice Grass). I was warned off the Microlaena because it really is a higher rainfall species, 500 – 700mm rain. As we are in a rain shadow, and a winter wet dry summer area (344mm rain per year), it was going to be a struggle to keep this looking reasonable without using more water than I wanted to. After all it is supposed to substitute for water hungry grasses. The good thing that happened is that the Windmill Grass is green and has been for two and a half weeks. That is in spite of at least four days with temperatures above 41C and at least seven days around 36C. I will be letting it go and observing how long it takes to be unacceptable as a lawn. I don’t see much point in having a lawn if it can’t be kept green. I was very pleased with the appearance of the plant. 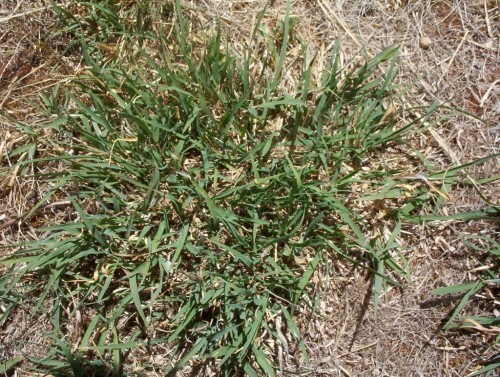 I had dismissed this species because my experience had shown it to be too tufted and therefore coarse to be a lawn. 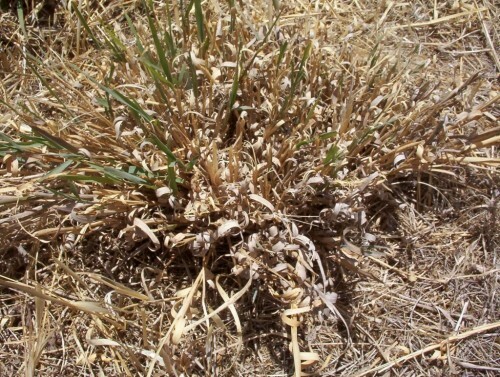 However the plant has spread and stayed low since it was mown about four weeks before the watering incident. I am not sure how this will go so far as foot traffic is concerned. I will deliberately use part of it as a pathway to see how it copes with occasional walking. Unfortunately the patch is not near the house where I could walk on it constantly. Some people have stated (and it is also in some articles) that Chloris behaves like an annual. We have not seen this characteristic because it is mown every year in late spring as part of our fire protection and to make it more pleasant to walk around our fruit trees. The mower is usually set at 3 out of a possible 6 settings. The mower is driven around on the 6 setting. 3 is a bit low for the spear grasses but for the Chloris it seems to be ideal. The patch seems to increase in size and thicken every year. I have been thinking of establishing a ‘lawn’ near the house partly to keep from tracking dirt into the house constantly and partly to have an area available for play. I don’t want vast paved areas. 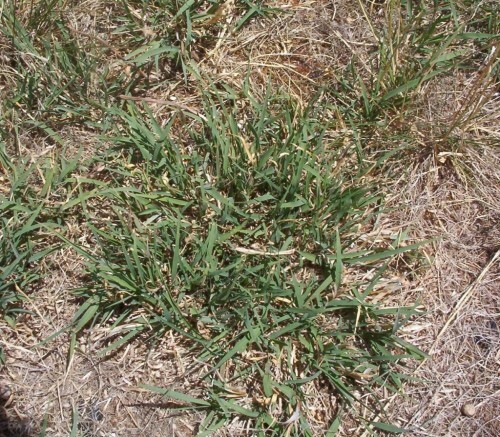 I know of a lawn of Wallaby Grass (Austrodanthonia Species) which works well but dries off in summer. 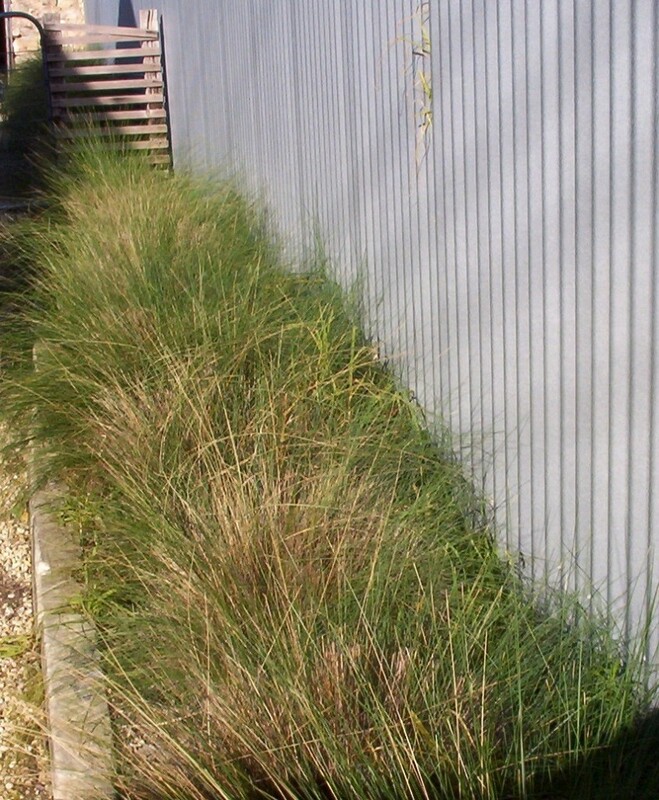 The idea of growing Weeping Rice Grass (Microlaena stipoides) with Wallaby Grass appeals to me. This grass has underground stolons a bit like couch grass. Couch is a real pest if it establishes itself in a flower bed. The idea of Microlaena running rampant appeals to me. (However I believe it can be a pest if it gets into flower beds). If it did I would get a faster ground cover. It is hardly likely to do that here with our low rainfall. To keep some greenness about it, it will probably need to be watered every three weeks during the summer. 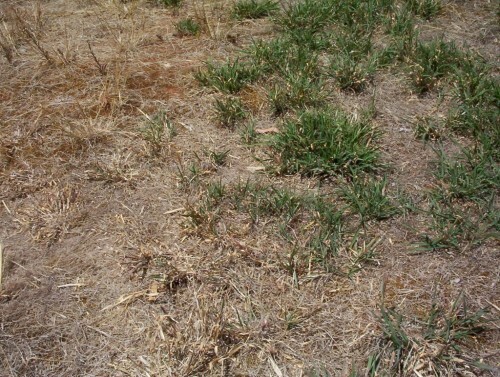 Even if water restrictions end up preventing that, I think it should hold and reappear when there is rain. The biggest problem will be weeds. To keep them down while the grass is establishing will be a constant chore but worth it. 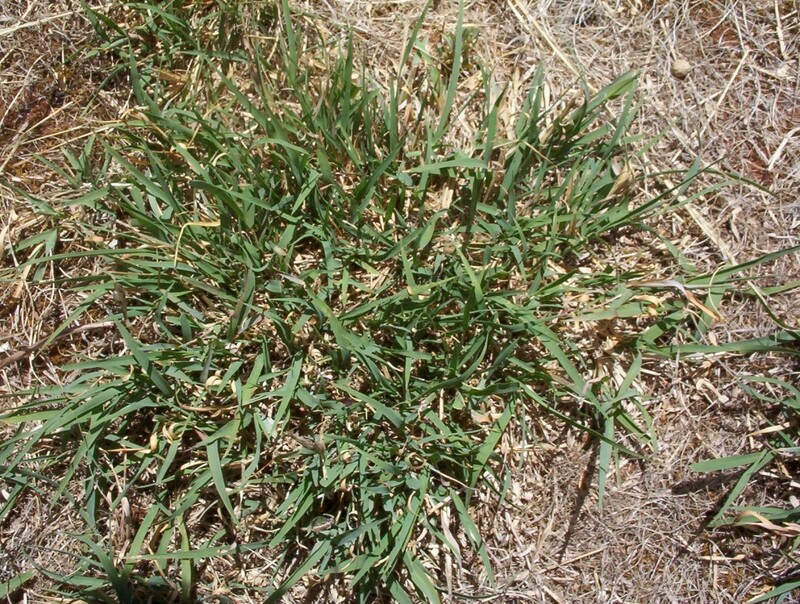 Where the native Poas have established and the large patch of Austrodanthonia, there has been a marked reduction in weed plants. So given a chance the Native Grasses will re-establish on our block and a lawn is not impossible. Mowing is minimal with these grasses as just trimming the flower heads is all that is needed. You are currently browsing the archives for the Native Grasses category.